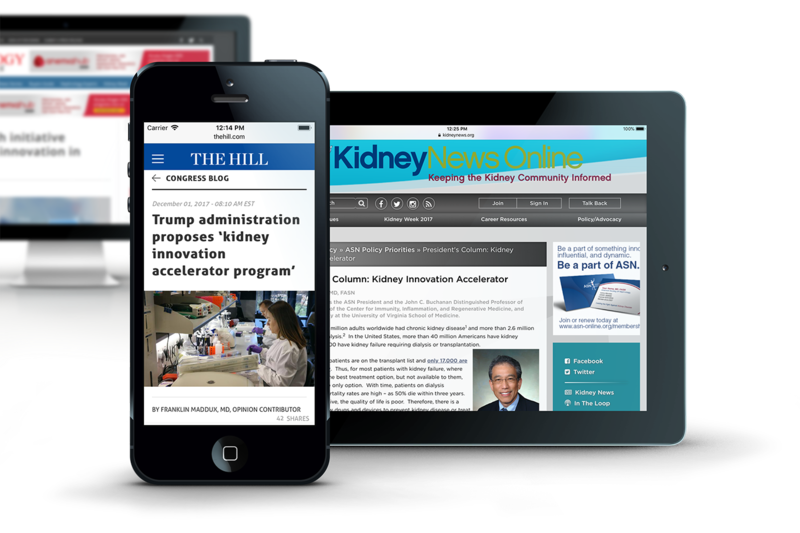 At ASN Kidney Week 2017, Bruce D. Greenstein, U.S. Department of Health and Human Services (HHS), Chief Technology Officer, highlighted the need for innovation in the nephrology space and announced HHS’ commitment to launch a Kidney Innovation Accelerator. Driving patient access to disruptive technologies via competitive, non-dilutive funding to innovators. Providing a clearer and less expensive path to bringing products to patients and their families. Creating a sense of urgency by spotlighting the immediate needs of patients and their families. Source: Report to Congressional Requesters: National Institutes of Health – Kidney Disease Research Funding and Priority Setting; United States Government Accountability Office; December 2016. Source: Erickson K, et al. Employment among Patients Starting Dialysis in the United States. Clinc J. Am Soc Nephrol 13: 265-273, 2018. Source: United States Renal Data System. 2017 USRDS annual data report: Epidemiology of kidney disease in the United States. National Institutes of Health, National Institute of Diabetes and Digestive and Kidney Diseases, Bethesda, MD, 2017. Source: Mitchell K. For Transplant Patients, 'This is Your Statue of Liberty'. GW Magazine. http://magazine.gwu.edu/for-transplant-patients. Published December 2, 2016. Accessed March 2018. Source: Kidney Disease Statistics for the United States. National Institute of Diabetes and Digestive Kidney Diseases. https://www.niddk.nih.gov/health-information/health-statistics/kidney-disease. Published December 2016. Accessed March 2018. "I am excited by the promise that KidneyX brings in developing innovative therapies to patients affected by kidney diseases. With the partnership and coordination between HHS and ASN, more and better ways are on the horizon for patients to manage their kidney disease - including artificial kidneys, biopharma products, and the like." "We aim to "de-risk" innovation by streamlining processes, reducing regulatory barriers, and modernizing the way we pay for treatment. This is going to require innovation from outside the government. We plan to stimulate and accelerate innovation through a series of cash prize competitions"
"For too long, innovation in the fight against kidney diseases has remained relatively stagnant when compared with other medical subspecialties. ASN is excited about the potential of KidneyX to catalyze research and development, remove barriers to innovation and commercialize therapies in the kidney space so that they become available to patients who desperately need them"
Individuals that are interested in being part of the KidneyX solution are encouraged to contact KidneyX at kidneyx@asn-online.org to be placed on a mailing list.